Kid-powered ice harvesting at the 2014 festival. Photo courtesy of Hanford Mills Museum. The Hanford Mills Museum’s annual Ice Harvest Festival offers a chance to take part in an ancient food-preservation tradition and some present-day culinary delights. Taking place on Saturday, Feb. 6, in East Meredith, the museum’s popular event demonstrates the old-fashioned method of refrigeration. Ice will be harvested from a pond that organizers say is frozen enough, even though Mother Nature hasn’t been particularly cooperative this winter. Some of the ice will be kept in the museum’s ice house until Independence Day, when it will be used to make ice cream during the museum’s holiday celebration. Ice fishing, blacksmithing demonstrations, horse-drawn sleigh rides and cooking demonstrations of 19th- and early 20th-century recipes round out the historic presentations. Pamela Cooley, a longtime Hanford Mills volunteer and master of the museum’s Royal Bride cookstove, will prepare savory and sweet dishes including sausage rolls, onion pie, Welsh rarebit, sweet potato pate, gingerbread, steamed chocolate pudding and peanut brittle using historic recipes and methods. Be sure to go hungry, because in addition to sampling historically accurate delights, festival-goers can participate in much more modern food traditions: food trucks; a soup buffet featuring offerings from local restaurants; and market booths selling cheese, meat and spirits from some of the Catskills’ 21st-century providers. The food trucks scheduled to participate are Roxbury’s Ate.O.Ate and Oneonta’s Cabana Coffee. The hot soup and chili buffet offers a chance to sample the wares of nearly two dozen local restaurants, including the new Meredith Inn, Delhi’s Cross Roads Cafe and the Delhi Diner, Oneonta’s beloved Brooks’ House of BBQ and Brewery Ommegang in Cooperstown. Junkyard Bakehaus will provide cookies. Proceeds from the soup and cookie sales benefit the museum’s education programs. Vendors will include Delaware County’s Byebrook Farm (whose gouda cheese is not to be missed), Larry’s Custom Meats from Hartwick and Cooperstown Distillery. The family friendly winter fun also includes ice sculptures by SUNY Delhi culinary students, a snowman village and a bonfire. 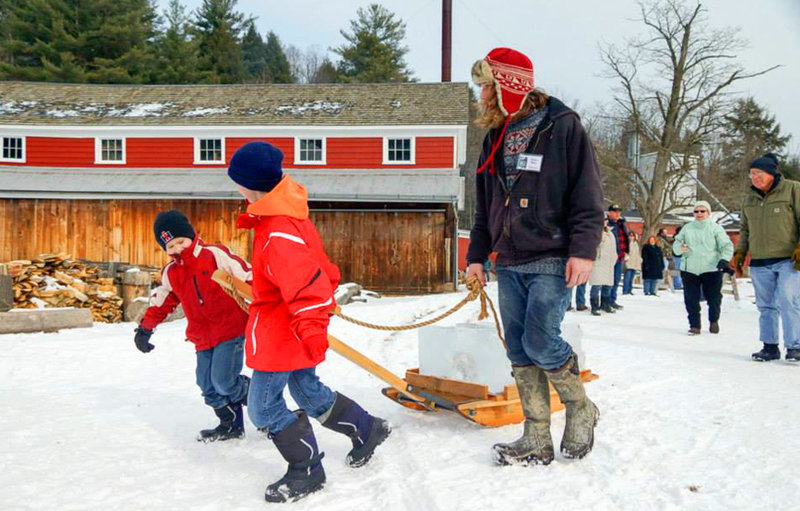 The Hanford Mills Museum Ice Festival 2016 takes place on Saturday, Feb. 6, from 10 a.m. to 4 p.m. Admission is $9 for adults and $7 for seniors; children 12 and under get in free. See the musuem’s Facebook page for more details and updates. For more Catskills food and drink events, see our full 2016 calendar here.